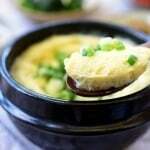 Kkaennip (or ggaennip) is a fragrant herb that is widely used as a vegetable in Korean cuisine. 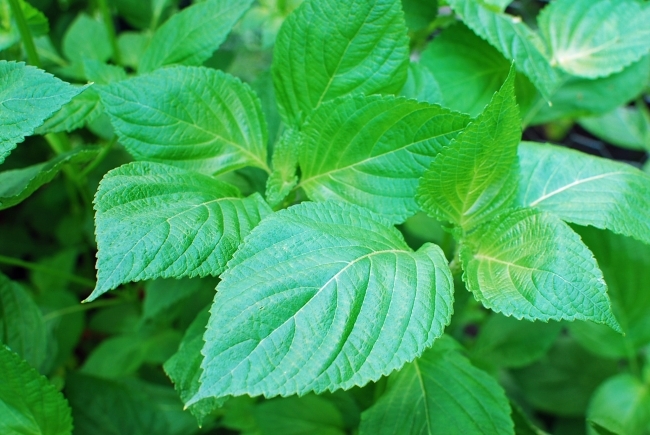 Like Japanese shiso, kkaennip is a variety of perilla which is a member of the mint family. Kkaennip plants are very easy to grow at home, either in a pot or the backyard. I’ve been picking anywhere between 30 to 50 leaves, every few days, from a few plants I have in my back yard — more than enough to share. You can buy fresh kkaennip at Korean markets. 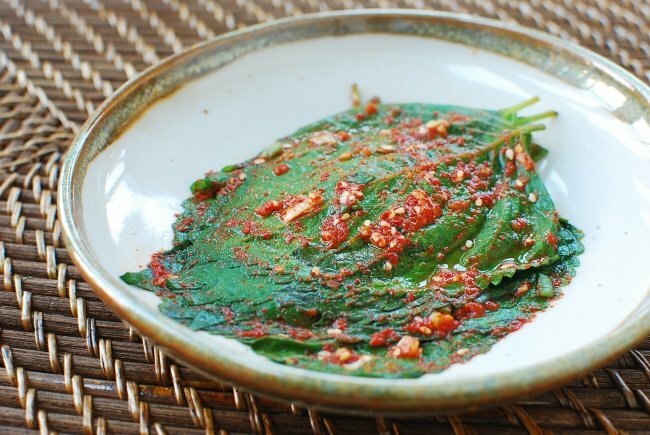 The fresh leaves are usually used as ssam (wraps) for grilled meat or fish, or added to bibim guksu, savory pancakes, or jjigae for extra flavor. 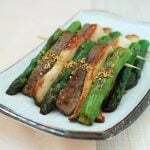 They are also great in gimbap (rice rolls) or pork rolls. 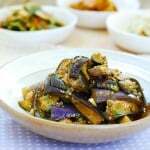 However, pickling kkaennip (either as jangajji or kimchi) is huge in Korea. 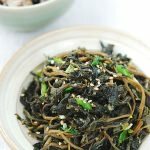 Kkaennip jangajji and kimchi are staple summer side dishes but also traditional ways to preserve this fragrant vegetable to be enjoyed during the off season. I’ve been stocking up by making several batches of both. 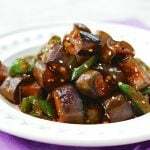 The jangajji version is typically pickled in soy sauce, which is another favorite of mine. Hopefully, I’ll be able to share the recipe on this blog soon. In the meantime, here’s how to make the kimchi version. Pick a leaf with the chopsticks and wrap a bit of warm rice in it and enjoy. It’s delicious! Wash the kkaennip thoroughly under running water one at a time. Hold the stems together, and shake off the excess water. Place them in a colander to dry or pat dry with a paper towel. 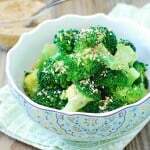 Mix all the seasoning ingredients well in a small bowl. Place 3 or 4 leaves at a time, in a bowl or container with an airtight lid, and spread a teaspoon of the sauce all over. Repeat the process with the remaining leaves. Rotate the location of the stem part of each batch to level the stack. Pour any remaining sauce over the leaves when all the leaves are used up. Cover tightly with the lid. Let it sit at room temperature for a few hours and refrigerate. You can start enjoying it right away, but it will keep well for weeks. Hi Hyosun! I have been following your blog for almost a year now but this is my first time posting. 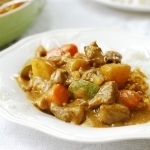 I absolutely love your flavors and have really enjoyed getting to know my heritage through your recipes. 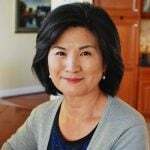 I am an adopted Korean and have found most of friends’ mothers reluctant to share their recipes or do not have them written down so I especially appreciate your beautifully photographed recipes and helpful tips. I love the flavor of perilla and can’t wait to make this tonight! Thank you for sharing!! Hi Carissa! 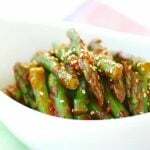 I’m so happy to hear you’re learning Korean heritage through my recipes. Thanks for letting me know! It means a lot to me. Hope you enjoyed the perilla kimchi.